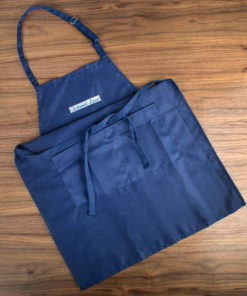 WE WILL NOT BE BEATEN ON PRICE! 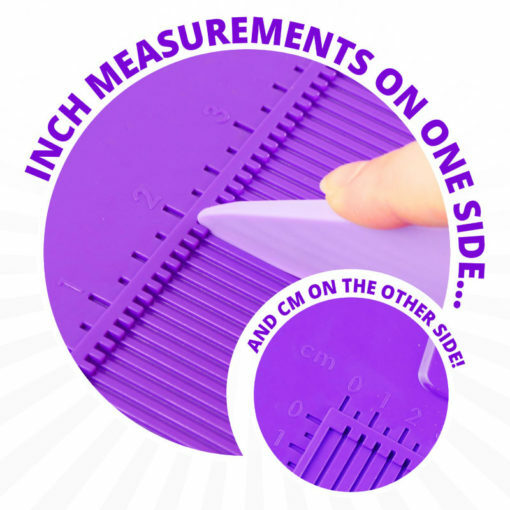 If you find a product you have purchased from us cheaper on the same day of your purchase, we will match it and give you 5% off your next order! 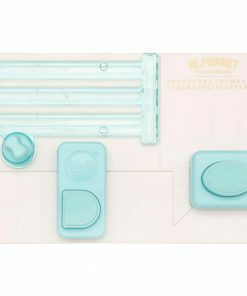 Simply complete the form below. 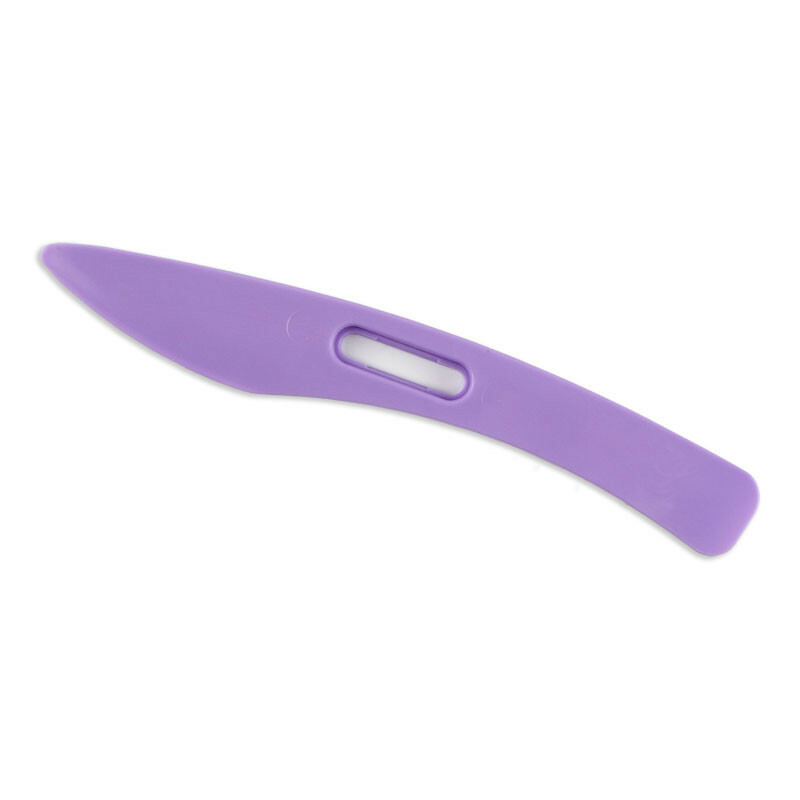 Please enter the same email address as on your order. 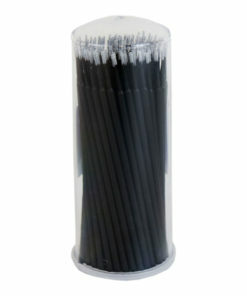 Please enter the full web address of the source. 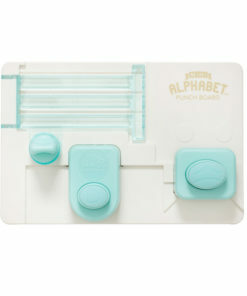 Following on from the much loved and successful Adorable Scoreboard from Hunkydory, comes the Adorable Scoreboard – Mini! 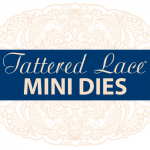 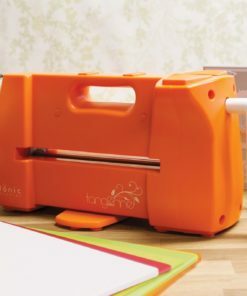 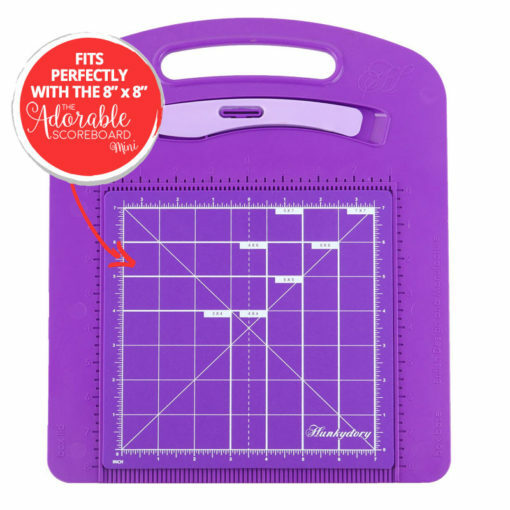 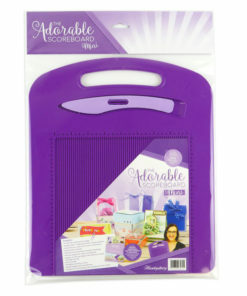 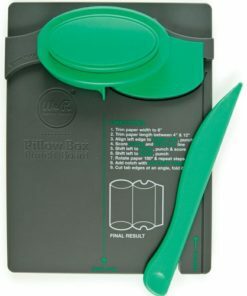 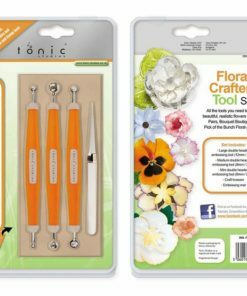 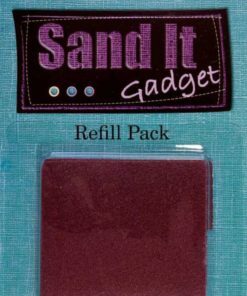 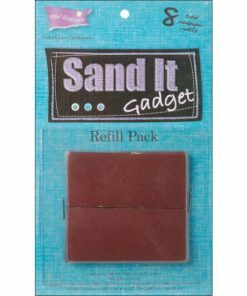 This smaller size has been designed with portability in mind, so whether you are going to a craft event or workshop, or simply crafting at home with limited space, the smaller size is so handy and easy to carry! With the features you have come to love from the original Adorable Scoreboard, including its box-making technology, ergonomic scoring tool and double-sided measurements for both imperial and metric. 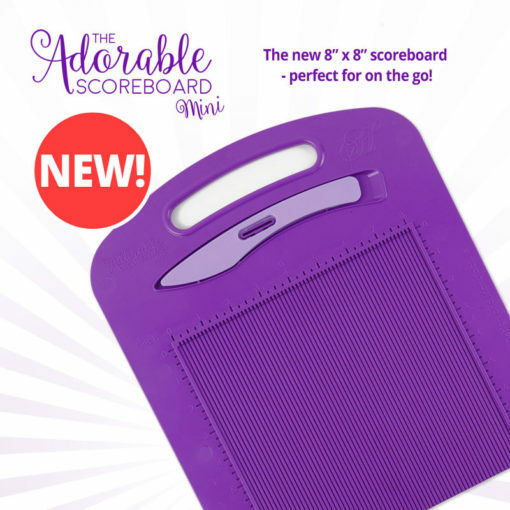 The scoreboard fits up to 8″ x 8″ and A4 cardstock, however as there is no bottom lip on the board you can also easily score larger sheets too for a wide range of cards and projects. 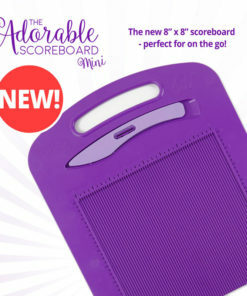 At just £19.99, this is an exceptional price for a scoreboard! 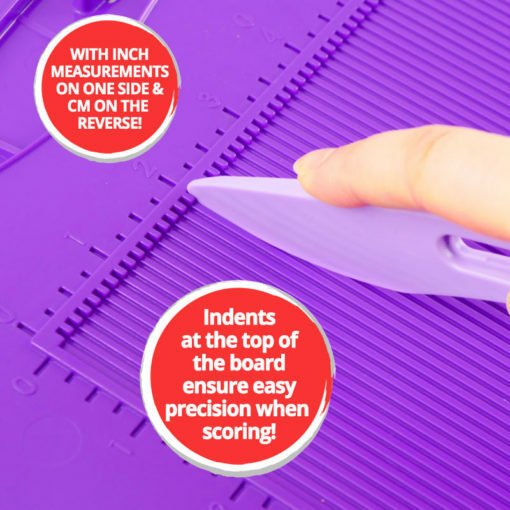 The board has been designed and manufactured in the UK, providing Hunkydory with control over every element of production. 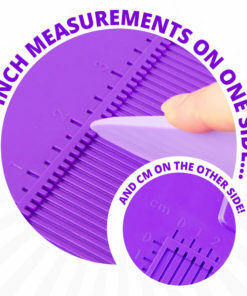 The board is double-sided with both imperial and metric measurements so you can work with cm or inches, and it contains increments as small as 1/8” and 0.5cm. 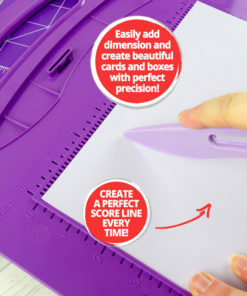 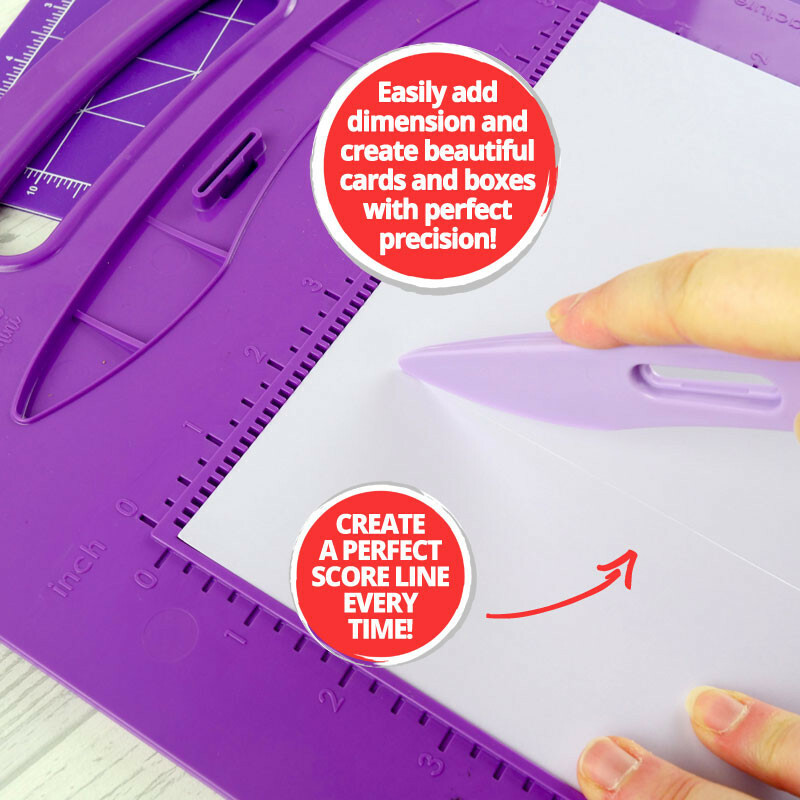 There are indents on the top edge to ensure full page scoring and the board is centre point marked, meaning you can easily determine the centre point of any piece of cardstock. 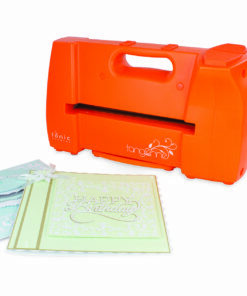 There is in-built box making technology included, which has made it easier than ever to create beautiful boxes. 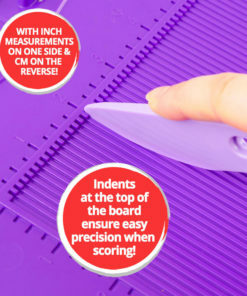 This works because the indent on the right hand side of the board is ever so slightly smaller than on the left, so if you make the lid from the left and the base from the right, they are then perfectly sized for each other! 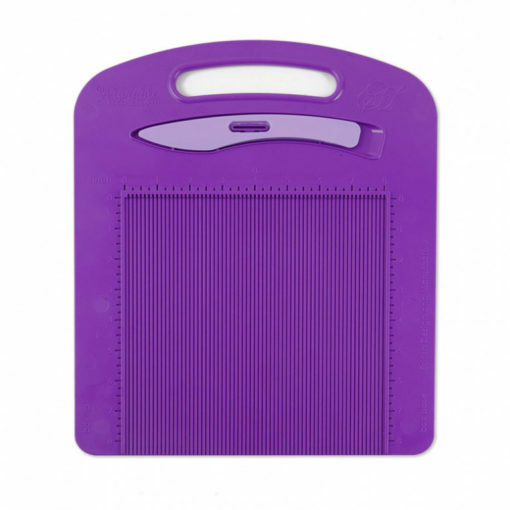 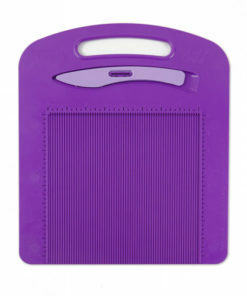 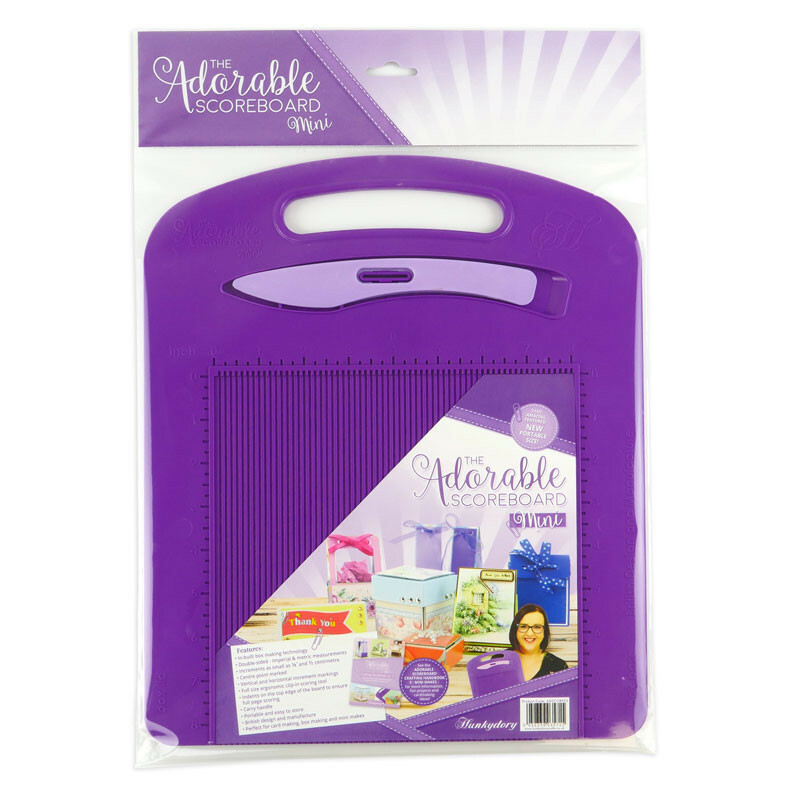 In addition to the great features, the board has an attractive purple design and carry handle for easy transportation. 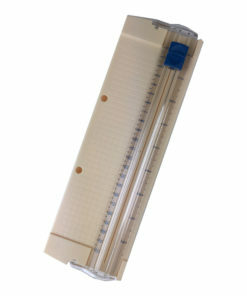 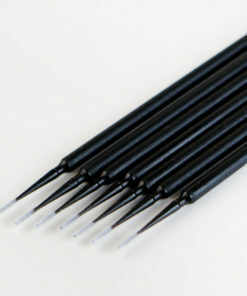 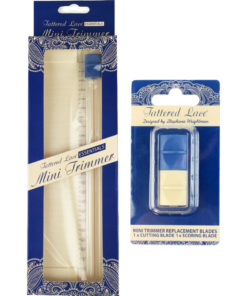 The full size scoring tool is ergonomic, with a wider top edge so that scoring doesn’t create a ridge on your finger. 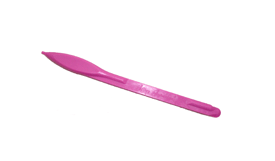 It feels so comfortable in your hand, yet is a substantial tool that will not bend when used. 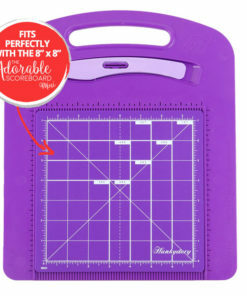 It even clips into your scoreboard, to keep it safe and close by. 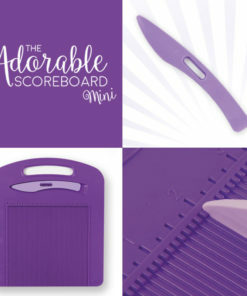 As this is such an essential addition to any crafter’s kit, the Adorable Scoreboard Mini will also make an amazing gift for the keen crafter in your life. 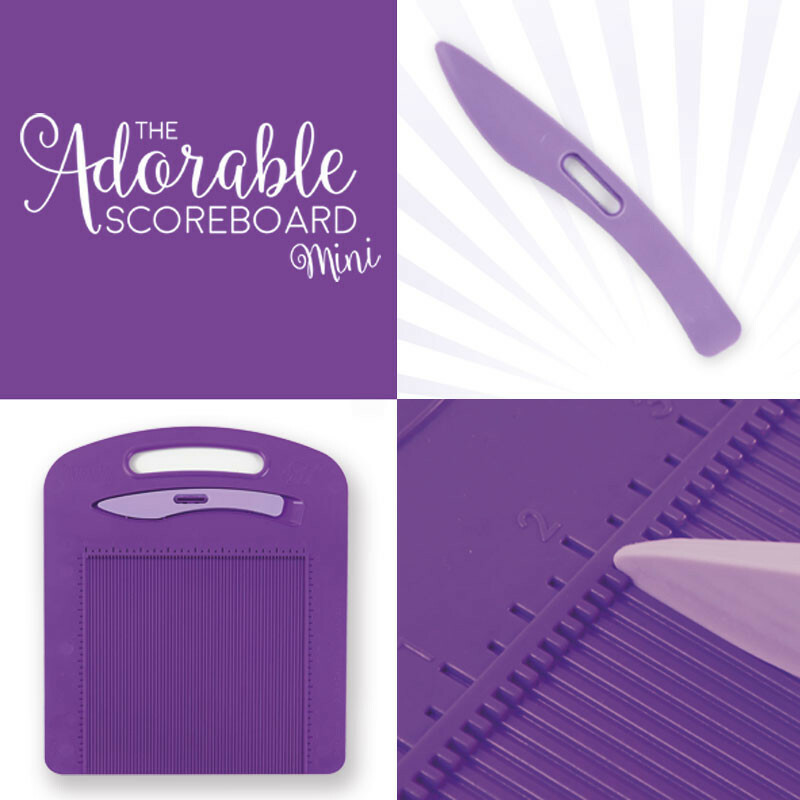 Why not complete the set with the coordinating 8” x 8” Double-Sided Cutting Mat, which easily slots into the Adorable Scoreboard – Mini.